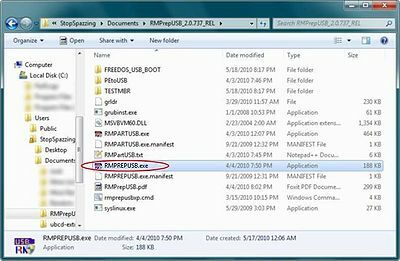 This tutorial will guide you through the steps to formating and copying over the UBCD to your USB Flash Drive with the program RMPrepUSB. This guide does not contain help on modifying any of the extracted content; if you are looking for a specific guide that is not available here, please check the UBCD forums for more help and information. 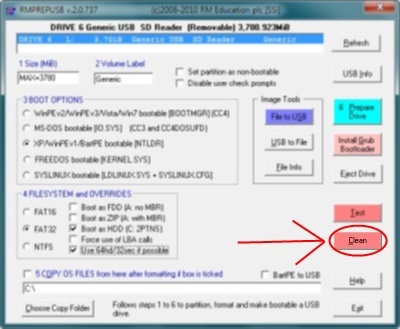 It is highly recommended that after completing this tutorial that you test the USB Flash Drive by booting your computer from it. The good news is that if it doesn't work the first time you can easily just edit/update files and try again unlike a cd/dvd where it is permanent. Makes adding more programs just as easy. WARNING: If you skip requirements, you do so at your own risk, as you may encounter issues that will be traced back to not being prepared. 1. The UBCD ISO, of course. Download it here if you haven't already. The ISO should be extracted by following the extracting instructions from a previous tutorial, located here: Tutorials:Remastering#Extracting_the_Contents. 2a. RMPrepUSB RMPrepUSB program (Freeware - for private use only). The RMPrepUSB version used in this tutorial is v2.0.737. There is an alternative tutorial number 87 at RMPrepUSB Official Site. Nevertheless, you should download the latest version of it. 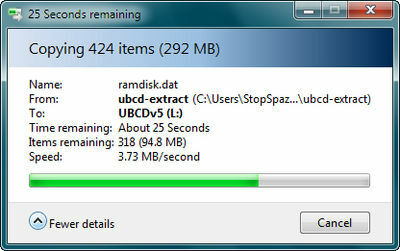 We have already extracted it to the same folder as the extracted UBCD ISO. For directions with RMPrepUSB, see Let's Begin! Option Two. 2b. RMPrepUSB is not 100% needed to create a bootable USB. For directions without it, see Let's Begin! Option One. 3. At least a 512MB USB Flash Drive. These and larger sizes can be picked up for relatively cheap just about anywhere. If you are going to be adding more programs to it, always make sure you have extra space. After checking that you have met all requirements we can proceed with the tutorial. There is also a YouTube video here http://www.youtube.com/watch?v=wX6BHnefIms This video demonstrates the procedure using RMPrepUSB. A real disk isn't necessary, a virtual disk will also work. 8. Use Safely Remove or Eject to remove the USB from the port to prevent data corruption. 9. Your done! The USB key is ready to go. Note: There is an alternative tutorial number 87 at RMPrepUSB Official Site using (at least) v.2.1.650 of RMPrepUSB. 1. 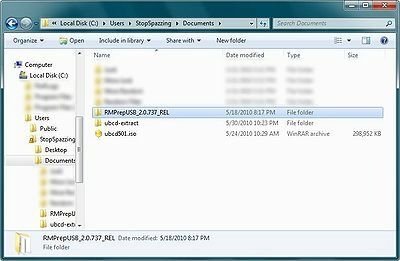 RMPrepUSB extracted in the same folder as the extracted UBCD ISO (ubcd-extract). 2. Going into the RMPrepUSB extracted folder you will find several items. The program you want to run is "RMPrepUSB"(.exe). Note: In Vista/7 you will have to run this program as Administrator. 3. The program should open and look something similar to this. 4. At this point I recommend you "Clean" the drive using the red Clean button near the bottom right side of the program. It will overwrite the MBR with 0's on the drive and could prevent errors from occurring during the next steps. You may skip this step tho, if you so chose, but if you get an error in the next step, then you may have to Clean it anyways. You will receive a prompt confirming whether you want to format or not, choose "OK" to continue, or "Cancel" to cancel. 3. BOOT Options - Allows you to choose several ways to boot the drive depending on your need and configurations. 4. Filesystem and Overrides - Formatting options with several advanced features. 5. 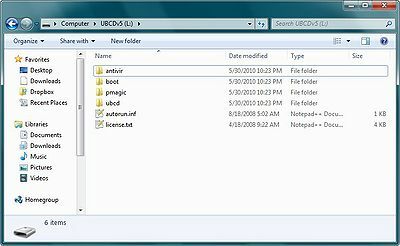 Location to folder you would like contents to be copied. 6. Prepare Drive - Starts the process of formating and copying files. 6. After you have selected the options/parameters, you may proceed and select the last step of 6 (see above image). 6.a The program will immediately ask you if you are sure you would like to use the selected parameters we have selected. Clicking "OK" will continue and "Cancel" will halt the process. 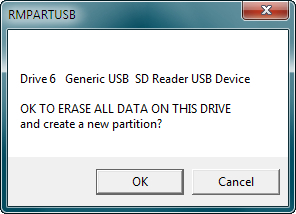 6.b Followed by asking you if it's "OK" to format and partition the drive. Note: You will lose all data on the drive if you continue. 6.c You may see a Command Prompt open and then suddenly close, this is normal. After the drive has been formated and partitioned, it will start copying the files over from the folder location we provided earlier, in this case "ubcd-extract" folder. 6.d Finished copying files over. A reminder that once we have finished, to eject (unmount) the drive instead of just unplugging the drive. (Optional) For RAID Drives ONLY, Boot from next drive if USB drive fails. ("1" is correct) Folder location for SysLinux boot loader. ("OK" Required) Asks you if you want to install SysLinux boot loader to selected location. This concludes the tutorial. If you have any questions regarding help or the instructions provided, please visit us on the UBCD Forums. You may also want to check out more Tutorials. This page was last edited on 8 November 2012, at 14:39.